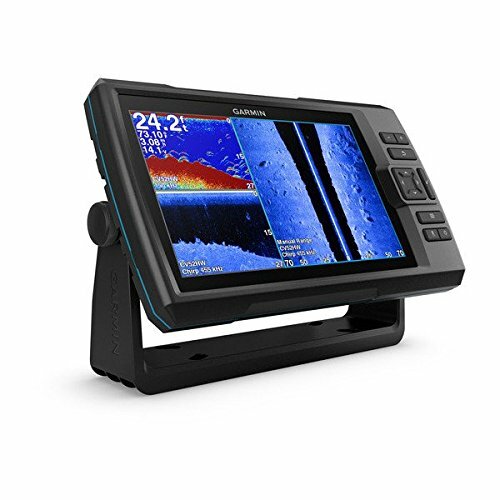 The Garmin Striker Plus 9sv is the latest addition to the long line of Garmin fishfinder products. It is the largest unit in the Striker Plus series. The 9sv increases your ability to catch not merely fish. The sturdily built unit was designed to function in a variety of environments. The unit measures 11.1 inches x 6.5 inches x 2.4 inches and weighs 2.4 pounds. The fishfinder also comes equipped with WiFi function, which provides access to the Garmin website and apps to make your experience on the water more successful. Whether you are on the water at high noon or in the moonlight, the backlit LCD screen automatically adjusts to provide the best view of images. The adjustable tilt-mount further enhances your view regardless of your position on the boat. The 9-inch screen gives you a bigger picture of what lies in the depths below. The images created are also crisp and clear thanks to the 800 x 400-pixel resolution in WVGA full color. The screen additionally displays the water temperature and boasts Ultrascroll, which provides images of fish targets regardless of boat speed. The Striker comes equipped with highly sensitive GPS technology that tracks your position anywhere you happen to be on the water. Mark waypoints of desired locations or create routes. In this way, when you find a hotspot, you can return time and time again. You also have the ability to mark boat ramps, docks and other terrain features to make your return trip easier to find. The GPS function also displays your boat speed so you never need to guess when trolling. The GPS does not support contour maps. The transducer emits signals at frequencies of 50/77 and 200 kHz. The dual-frequency sonar emits signals simultaneously in the 50/77 and 200 kHz range. The dual-beam sonar emits 77 and 200 kHz frequencies. The CHIRP sonar functions at mid and high ranges. The ClearVu and SideVu sonars emit signals at frequencies of 260/455/800 kHz. Dial the CHIRP sonar at the medium, high or both range levels at once. You decide what frequency targets the spectrum needed to find the fish. The broad range of frequency options reduces noise while providing better HD images. The combination makes for enhanced target separation. You also have the signal power to reach greater depths. The multi-colored display provides clarity between baitfish, game fish, vegetation and obstacles below your boat. Unlike 2D sonar that does not provide highly detailed images, CHIRP ensures you see the finest details. By tweaking frequencies, you also have the chance to see your jig in motion. ClearVu provides a 180-degree image in a monochromatic display with clarity comparable to having a live camera beneath the boat. Whether standing still or trolling along, you see fish as they actually appear instead of relying on arched displays. See brush, timber, rocks or manmade structures with amazing detail. You can also split the screen image to combine ClearVu with CHIRP or your charts simultaneously. SideVu displays the view from side to side from behind your vessel. On SideVu, the screen displays a 180-degree perspective of the underwater environment, as the beam scans up to 240 feet to either side of your vessel. The steady stream of pings emitted and the information received by the sonar combine to create a photographic-like image from the bottom of the body of water upward. The images remain clear regardless of the water’s condition. You can also use the zoom function to magnify the image for greater detail and mark waypoints when needed. Similar to ClearVu, the differences in image coloration reveal the bottom profile, flat, descending or rising terrain features. You will also easily differentiate between weeds, branches, timber or architectural features below the water’s surface. Whether busy trolling close to shore or above the deepest depths, the Quickdraw Contours software feature creates high-definition maps of your journey along the way. The Striker also enables you to store up to two million acres of highly detailed maps that provide contours for every square foot of terrain. Thanks to your wireless WiFi connection and a mobile device, you can access the all-in-one ActiveCaptain app, which provides notifications directly to your Striker Plus 9sv screen. You can also visit the Quickdraw Contours Community to download previously created maps or upload some of your own to share with other anglers. The connection also enables you to get regular updates to your device.